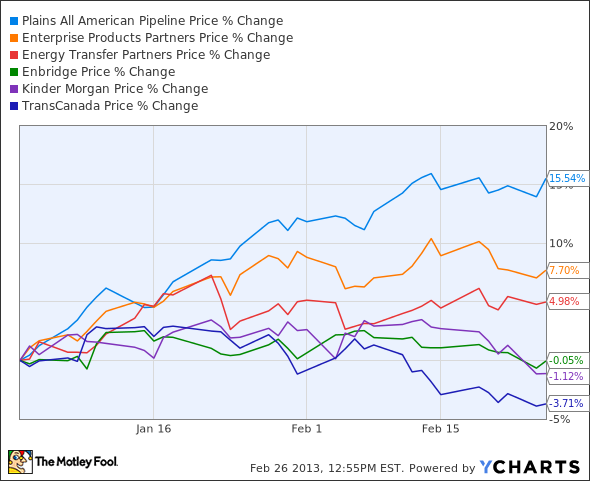 How those lucrative midstream companies fared in Q4. Now that the major midstream companies have all reported fourth-quarter and full-year earnings, it's time to compare them to each other! 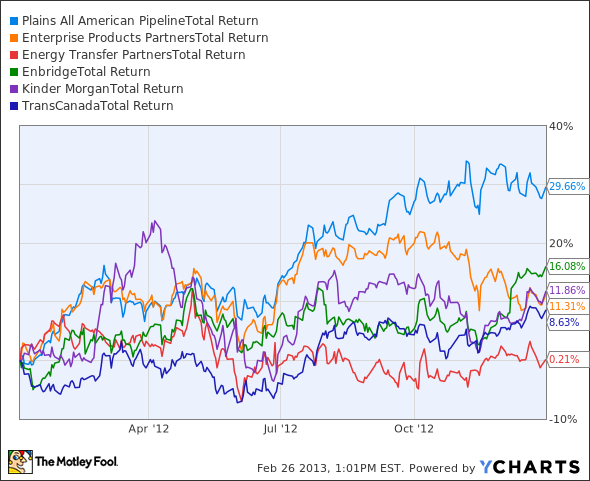 Today we'll take a glance at the individual performances of our favorite pipeline companies and determine whether there are any industrywide trends of note that will affect them going forward. Kinder Morgan (NYSE: KMI) and Kinder Morgan Energy Partners (UNKNOWN:KMP.DL) put together an excellent quarter. KMP generated a 20% increase in segment earnings year over year. The natural gas pipelines and CO2 segments lead the way, while declines in refined products volumes and NGL prices subtracted from what was otherwise a tremendous quarter. Enterprise Products Partners (NYSE:EPD) crushed earnings estimates and set several full-year records, including new highs for net income and earnings per unit. Despite declines in its NGL pipelines and services segment and its offshore pipelines and services segment, the petrochemical and refined products, onshore natural gas pipelines, and onshore crude pipelines segments all posted gains. Plains All American Pipeline (NYSE:PAA) also posted record-breaking numbers and easily bested management's guidance for adjusted EBITDA and distributable cash flow. The partnership's supply and logistics segment rode off into the sunset on the back of strong butane margins and wide price differentials for domestic crude. TransCanada (NYSE: TRP) did not fare as well as its American cousins, missing analyst expectations on both EPS and revenue. All three of the company's business segments experienced a drop in EBITDA year-over-year. Despite this, the company increased its dividend 5%. Enbridge (NYSE:ENB) fared slightly better, beating on revenue and missing on EPS because of an asset impairment charge. It was a mixed quarter for the company, as its liquids pipelines group posted a $57 million improvement year over year, but its gas pipelines, processing and services segment fell, as did the contribution from its sponsored investments segment. Energy Transfer Partners (NYSE:ETP) posted its best quarter in recent memory, as EBITDA for its interstate transportation and storage segment just about tripled. Intrastate transportation and storage and its midstream segments continue to be trouble spots, but the long-term outlook here is quite bright. The natural gas liquids price environment definitely had an impact on several of the companies and partnerships listed above. Overproduction dropped the price of ethane to an all-time low by the end of 2012. This stung any midstream outfit that took possession of ethane, but it also meant declining volumes in some places as producers pulled back from the low-price environment. Propane prices fell significantly as well. The expectation is that prices will rise again by next year. Demand for ethane and propane is growing, and is expected to continue to grow as the petrochemical industry makes the most of this tremendous supply; it just isn't quite there yet. The other trend is slightly more obvious, which is that it really pays to be in the crude oil transportation business right now. Liquids pipelines are so full that midstream operators like Plains All American are making a killing there, and putting all the extra on trains to more lucrative markets. Those are some impressive yields. It should be noted that in the midstream industry, dividends and distributions play a very important role in performance. Energy Transfer Partners is the example most use when highlighting just how important that is. The partnership hasn't increased its payout in years. Management is committed to working toward an increase, and the fourth quarter is absolutely a step in the right direction. Plains' focus on crude oil is really benefiting the partnership right now. However, I would expect to see a big lift in the Enterprise Products Partners line when the prices of ethane and propane pick up. Not every company in the midstream industry is a guaranteed winner, but there are plenty of opportunities here for investors to take advantage of a favorable macro energy environment and invest in income generating stocks. The list above is just a start, as there are plenty of midstream master limited partnerships out there, with more on the way.